Hello everyone. I’ve had a great, albeit very busy, week in Wray, Colorado. 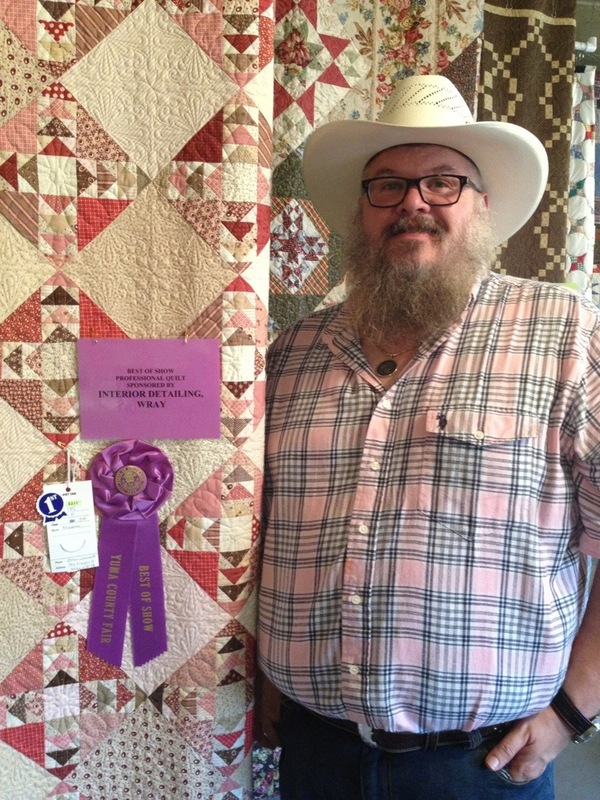 With the help of many people, and many area businesses, we pulled off the 16th Annual Quilts of the Plains outdoor quilt show, this past Saturday, June 27, 2015. We had a great array of wonderful quilts entered into the show, including many from far, far away. 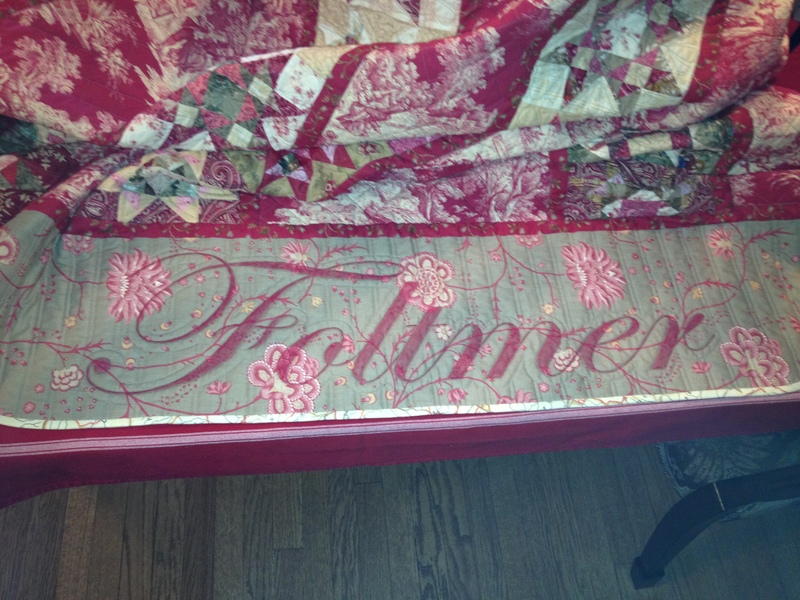 Our Viewer’s selected a lovely quilt by Valerie from Dove Creek, Colorado. They also awarded a total of 8 ribbons for the best in category voting. 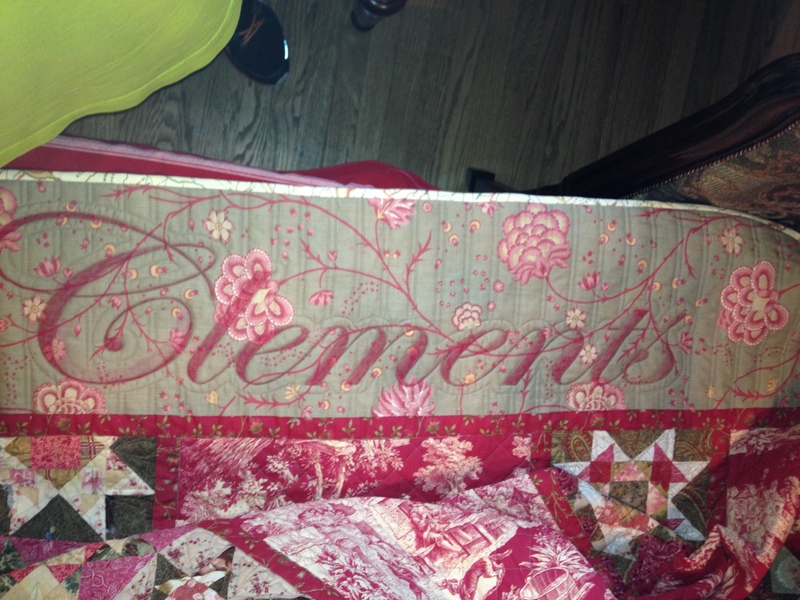 I’ve uploaded a photo gallery of all of the quilts. I think they all are winning quilts. Mixed in, you will also see some street and sidewalk shots. Perhaps, I caught you looking at the beautiful quilts, or driving down the street. You’ll see the kind of businesses that line our streets, and help to make Wray such a wonderful place to live, work, shop, or even visit. Of course, photos never do full justice of an event like this. I do hope it’s a useful resource though, for quilters who entered or viewed the show, as well as a shameless promotion of our town, our people, and our humble little quilt show on the plains in Colorado. I hope it makes you want to be a part of it in the future. Have fun looking through the gallery. I’ve made smaller versions of the photos, so it will load quickly on your computer, phone or tablet with ease. If you have a need for a more detailed image, I can provide that on a request basis for you. Thanks for supporting quilting in Wray, and for your continued interest in my life, art and blog. I’d really appreciate if you could share this with others, and leave a comment when you stop by the blog. It really adds a richness to the place. I hope you have been inspired, and this will manifest in your creative life, whatever that may be. 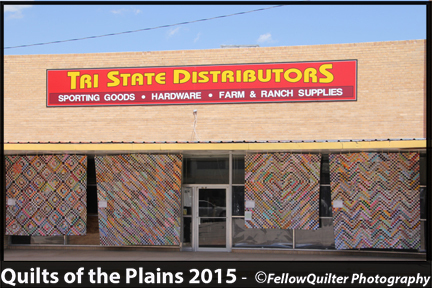 Quilts of the Plains 2015 Is Almost Here! I’m busy quilting the last of my projected quilts for this years show. I really love how this is turning out, and it will be a perfect gift for a lucky person in my life. It’s a secret, so I don’t want to say much more. Hi everyone! It’s been a great year, and I hope you’ve had some time to work on your quilt projects. I’m finishing up on the last two king-sized quilts that I intend to exhibit into the show. As you may, or may not know, I am the Chairman of the Quilts of the Plains annual outdoor quilt show, held in Wray, Colorado each year. The event is held on the Saturday AFTER Fathers’ Day each summer. That being said, This years show is on June 27, 2015! The Quilts are on display for ONE DAY ONLY, June 27, 2015 from 9:00 a.m. until 4:00 p.m. Most quilts are displayed along Main Street from 3rd to 5th Street, and antique and miscellaneous items will be displayed in the Wray Museum. The quilts will not be judged, but the Viewers will vote for their favorites. The overall winning quilt will be awarded a BRAND NEW JANOME SEWING MACHINE, and Viewers’ Choice Ribbons will be awarded in each of the categories listed below!!! I hope you’ll enter, and GOOD LUCK TO YOUR QUILT!!! 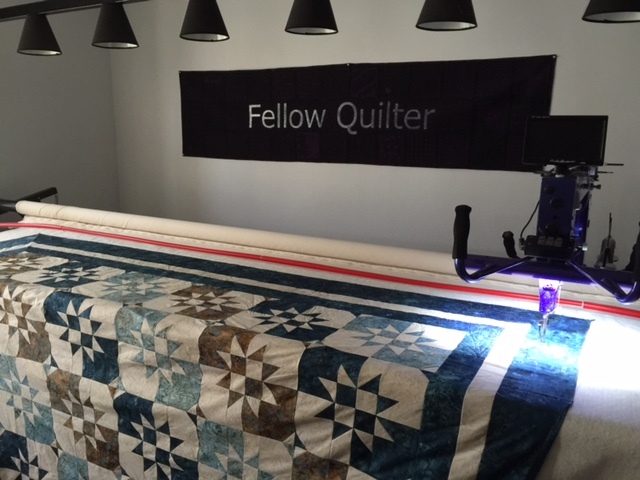 We NEED your quilts, or we won’t have much of a show…. We don’t have a restriction on the items you enter. You may have made it this year, or many years ago. We kindly ask that you not display items that have previously been in the Quilts of the Plains Show. You may enter as many items in each category as you wish, and we LOVE seeing the creativity that each and every person has exhibited in their quilts. The categories remain the same. Entries will be accepted at Rainbow Fabrics from Monday, June 22 to Thursday, June 25. If you have a need for an accommodation outside of that schedule, please let us know. 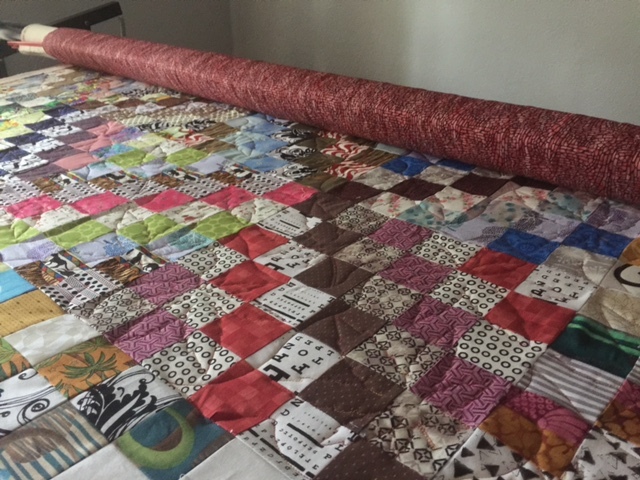 This photo was taken a few months ago, as I was beginning to quilt the raffle quilt for Quilts of the Plains 2015. As you can see, the colors are gorgeous, and the fabric is all batiks. The blocks were made by local members of the Quilters’ Anonymous group here in Wray. Again this year, we have a spectacular raffle quilt. Made of batik fabrics in lovely shades of blue and cream, you are gonna love this one. The quilt is on display at Rainbow Fabrics. Tickets are ON SALE NOW through the day of the quilt show. 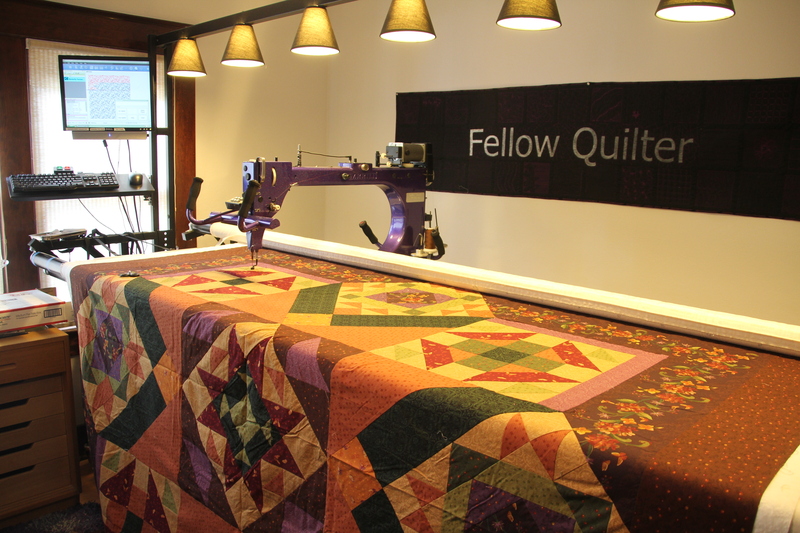 The Disappearing Hourglass blocks create a very beautiful block, and the quilting was done by Fellow Quilter, Brian Clements. (ME!) Tickets are still only $1 each, or 6 tickets for $5. We rely upon the help of many volunteers. If you can help, we’d be grateful for anything you can do. We need people to hang the quilts, take quilts down, push a cart along and hand quilts to the folks up on the ladder… At the end, we need some volunteers to take down quilts, fold quilts, sort and checkout the quilts to their owners. We will have an information table, and need people to sit and sell raffle tickets. Even an hour or two is a huge help! Please let us know how you’d like to help. Lastly, I must thank our sponsors. The quilt show is presented by the City of Wray and the Wray Chamber of Commerce. The main sponsor is Rainbow Fabrics, and supporting sponsorships from Foltmer Drug/RadioShack/Main Street Clothing, Box Elder Ranch, First Pioneer National Bank, Leigh Floral, Wray State Bank, Ann & Steve Brethauer, and Wray Lumber Company are much appreciated. Thanks for your support. I hope you can come to the show!! What caught my attention was the way the light played across the different parts. The strings, the pins, and the felt all had different reaction to the light. We should translate these ideas into our quilt projects. How is the light going to bounce across the patches? How does it look up close? Is it dynamic when viewed from a distance? Don’t be afraid to think about these types of questions. There isn’t usually a right/wrong idea. Develop your own eye for what looks good to you. Your admirers will take notice. I decided to add a little poll for my readers. I’ll keep track, and I’ll update the results in a future post. Click here to take my 30-second poll. I hope this journey is inspiring to you. Thanks again to GrayDaysAndCoffee for inspiring me. Recently, Joe and I took a road trip in the Pacific Northwest. 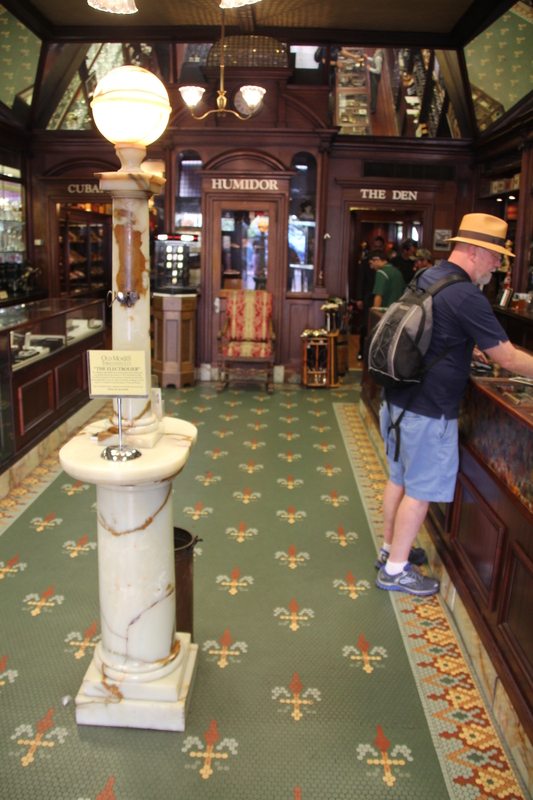 I thought I’d share a couple pictures from the Old Morris Tobacco Shop in Victoria, British Columbia. 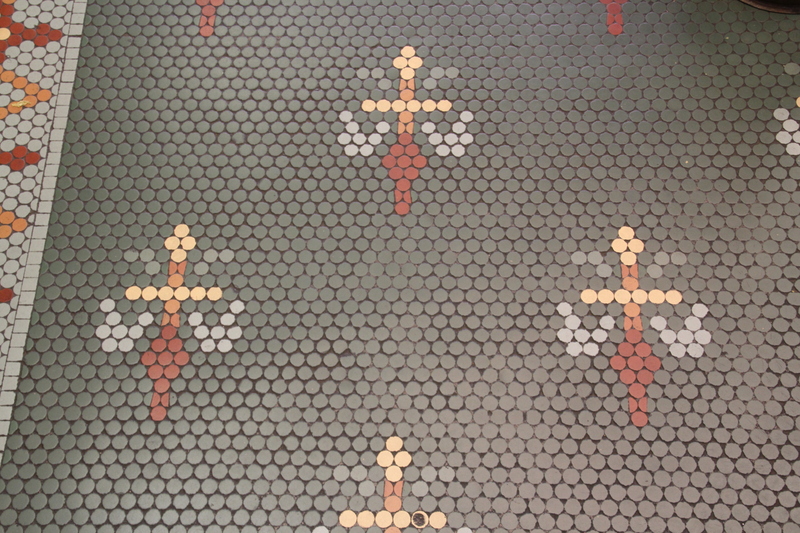 I really loved the old tile floors, so I had to snap a couple of shots, so that I’d remember them. Also… the marble light pole in the middle of the room is an antique Italian marble floor lighter. Yes, it still works. They told us it is one of only two in the world. A great shop… lots of manly inspiration here. Maybe someday, these inspirations will wind up in a project. Who knows? Also, today is the day that I’ll be entering my newest quilt into the Yuma County Fair. It’s a strippy quilt that features a vintage French fabric that Joe purchased for me at a show many years ago. I knew it was destined to become something very special. I followed the quilt project, as it spoke to me and told me what to design next. It really was a labor of love. Just an update to let you followers know that the Miniatures quilt won Professional Best of Show at the Yuma County Fair in Colorado. In addition, the award I sponsor, for best use of color in a quilt, was awarded to my good friend and customer, Chris Wade of Wray!!! I thought I’d make a quick blog entry to remind you about the Yuma County Fair. I am a big supporter of the fair, especially the open class quilt exhibits. I make a point to enter at least one quilt each year. The main reason I do, is to get feedback from the trained quilt judges as to my work. Over the years, I’ve learned many things, and my quilt-making is improved as a result. So… you’re wondering why I’m writing this. There cannot be a quilt exhibition, without the quilts! Entering is easy… just drop your quilt or quilts off at the Yuma County Fairgrounds in Yuma, Colorado on Sunday, August 4th from 1:00-4:00 p.m. or on Monday morning from 7:30-9:00 a.m. Don’t worry too much about the competition, as there are many age groups and levels to accommodate everyone. Think how proud you’ll be to see your quilt on display at the fair. If you do drop off your entry on Monday… you might consider staying to watch the judging. It’s fascinating to hear the judge comment on what makes one quilt stand out, or what might have made the quilt more stunning. I’ve learned a lot by listening… just wish I could attend the judging every year, but Monday mornings are very busy at the stores. I’ll be entering this quilt, entitled “Miniatures”. You may have seen it at the Quilts of the Plains show in June. 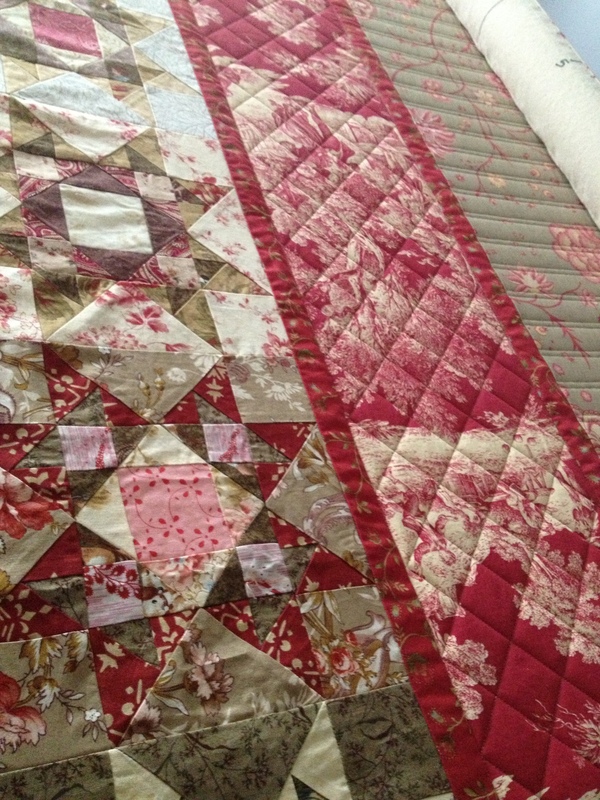 It has some great quilting, and the flying geese blocks are super small. It was fun to make, and I hope you’ll come and check it out, as well as the many other quilts that will be on display. I hope I’ve inspired you to share your work with others through my blog posts. I welcome your comments, and I hope to see you at the fair! Bye for now, and happy quilting, gardening, BBQ’ing, or whatever summer activities that you enjoy! Hello everyone… Well, it’s been quite a while since my last blog post — six months actually. I stopped blogging when I left to go to China, Tibet and Hong Kong back in September 2012. I had every intention of blogging when I came home, because I was filled with lots of inspiration–however I just never got around to it. We had a wonderful tour guide in China named “Mr. Lee”. Ironically most of our guides had astoundingly English sounding names. Of course, I’m sure they have beautiful Chinese names. They probably just got tired of correcting mispronouncing tourists. One of the things that really stood out for me during our trip was how the Chinese government blocks a lot of the Internet from the citizens. I quickly discovered there was no Facebook, no WordPress–and these are tools that I use on a pretty much daily basis in my creative life. Since I’ve been home, I’ve actually done quite a bit of quilting for customers. Since the first of the year, I kept a few slots for myself and I’m proud to say that I have quilted four of my own quilts since then. Three of them are bound and finished. The fourth one is just waiting for me to decide if I’m going to do straight edges or a scalloped or wavy edge. 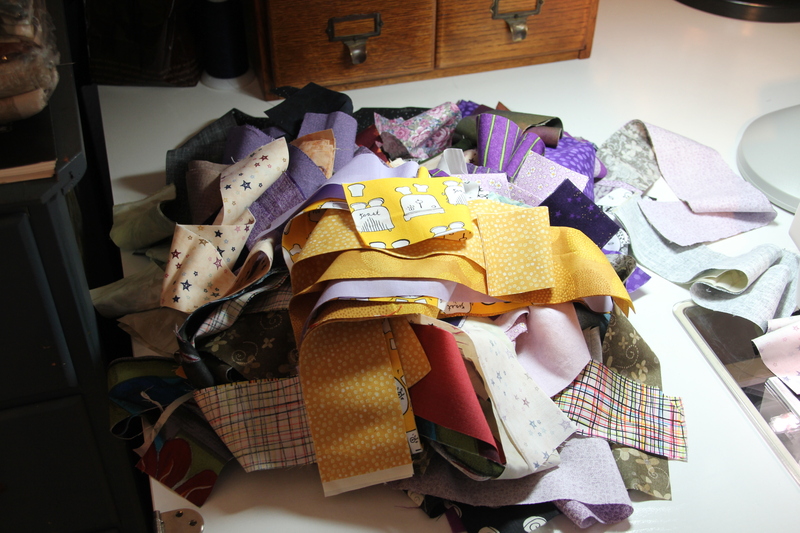 Once I decide, I can go ahead and trim the quilt, put the binding on it and it will be done. It’s actually destined to be my next show or museum quilt. I’ve finished the scrappy trip around the world quilt which I’ve blogged about before. It’s a glorious riot of color, and it made a good dent in my scrap bins. I will get a picture posted one of these days on my blog so that you can see it. I’ve also made another quilt top out of my scraps, using the technique of the “Jelly Roll Race” which you can find by searching on the Internet. It was a really fun project. Today, my next quilting customer stopped by to drop off her quilt top, and select backing fabric, threads and quilting design. It really is a luxury when I can meet with a customer face-to-face in my studio because then I have access to my quilts as samples to show threads and colors, and also to show designs stored on my computer from my library of possible designs. Now that those choices have all been made by the customer, I am ready to get started and get that quilt done. I hope to finish it before I leave on my next adventure. I won’t tell you where yet… but I do hope to return very inspired… and ready to blog! Today, I’m taking a break from customer quilting and quilting one of my MANY UFO’s. It is a pattern called “Butterfly Kisses” by Nancy Davis Murty. Her blog is located at http://nancymurty.typepad.com/ and this is the third of her quilts that I have pieced. I’ve also done “Harvest Home” and “Harvest Spice”. 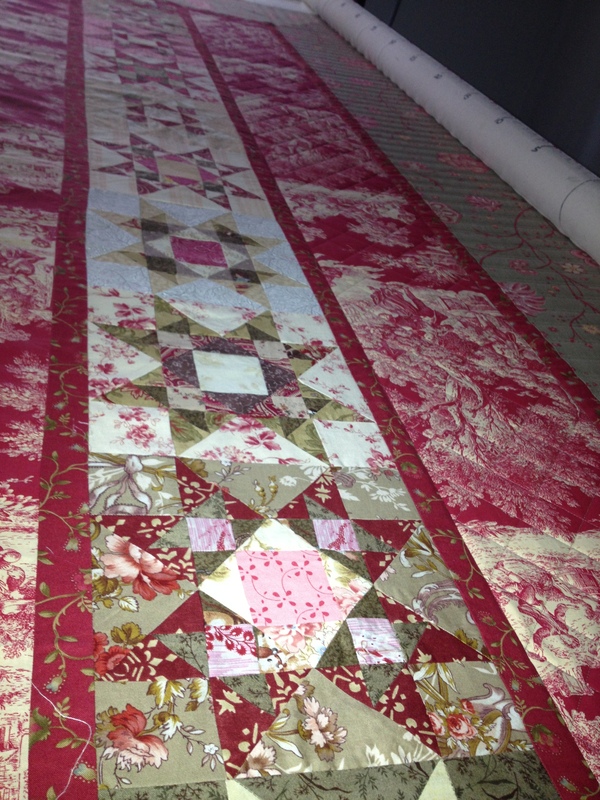 It is quilting out beautifully with a pattern called “Butterfly Fantasy”. Pretty cool, eh? As you may know, I finished the 256th block for my taupe quilt, “Blue Ridge Beauty” on August 8th. What a great birthday gift… On that day I turned 47 years old, and although I didn’t plan this out… my birthday was the 47th consecutive day I have worked on my quilting projects in a row. I am amazed at the amount of work that I’ve been able to accomplish during this time. After working so hard on those 256 blocks, I’m ready to give that project a break for a few days. So, I decided to work on my “Scrappy Trip Around the World”. This project is one that I’m making from my scrap bins, but cutting 2.5 inch strips from scraps, and some small pieces from my stash to round out the color selections. Here is a photo of one of my scrap bins. I actually have about 5 of these. One is for selvedges, another is for leftover binding strips, one is for small strips to use for locker hooking, and two others hold random pieces that are left over from various projects. I try not to return odd size pieces to my main stash, which consists of 26 elfa drawers like the one in this picture. 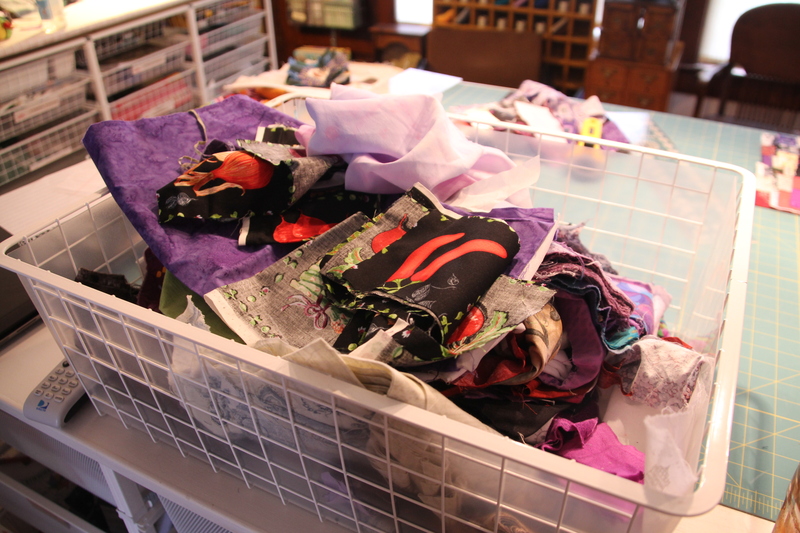 My main stash is sorted by colors, and neatly folded, unlike the scrap bin. In the class I recently took, I was reminded that the scraps are also worth $10/yard, so it got me set on a course to use some of them for something nice. This scrappy quilt is super easy to make, and is a riot of color… which of course, I love. So, probably the part I don’t want to do is to pull out the fabrics and iron them flat. Next I stack up my pressed scraps. 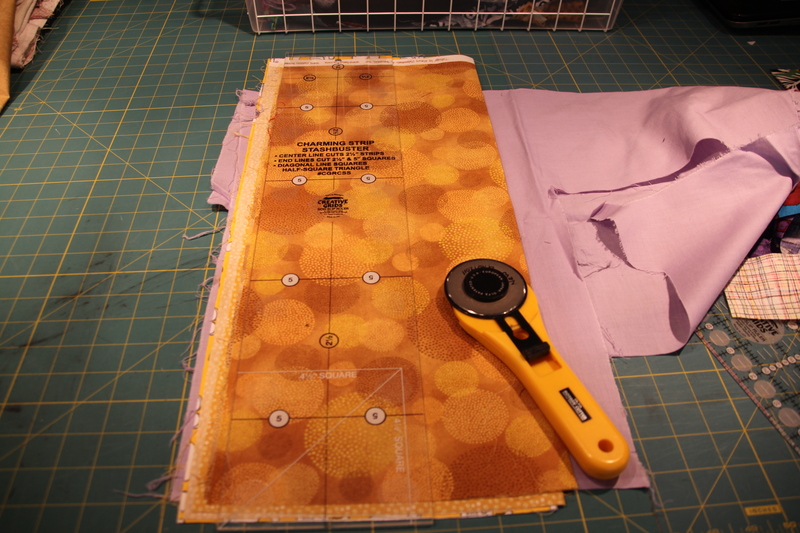 I usually can cut 8 layers with my giganto 60mm rotary cutter… but you might want to try 4 to 6 layers. I use this Charming Strip Buster ruler for this task. It’s 5 inches wide, and marked only for 2.5 inch strips, and 5 inch squares. (You know the ones… just like the popular charm packs put out by many fabric manufacturers these days.) But today, I’m making strips, so that’s what I’ll show. So this is how the strips look after you cut them. They are random lengths. But for this project, I only need 15 inches, but I’ll cut them 16″ to have a bit of wiggle room in my strip sets. 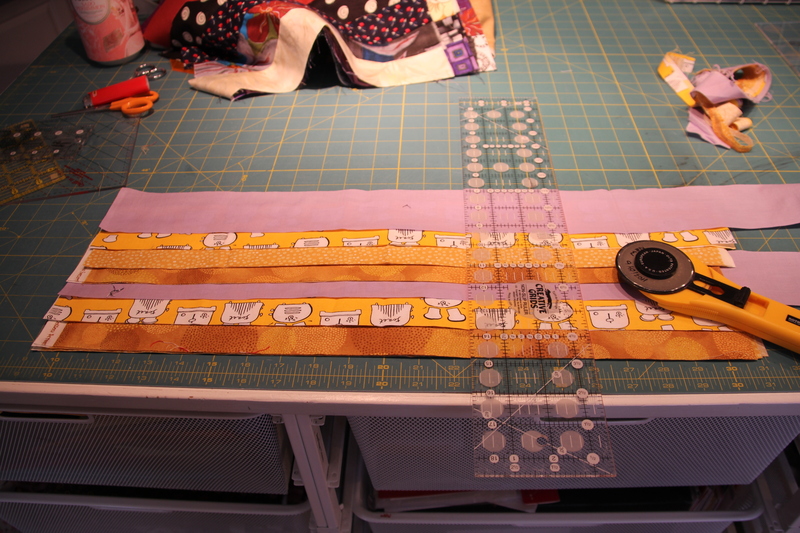 There is no need to waste much time sewing strip sets longer than I need. 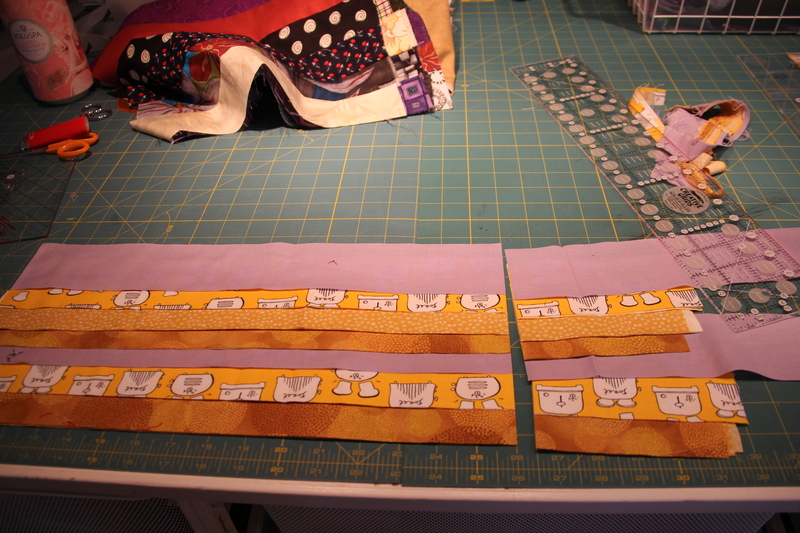 Now, I’ve got a huge pile of strips, ready to be sewn into sets of six. No color planning is allowed. 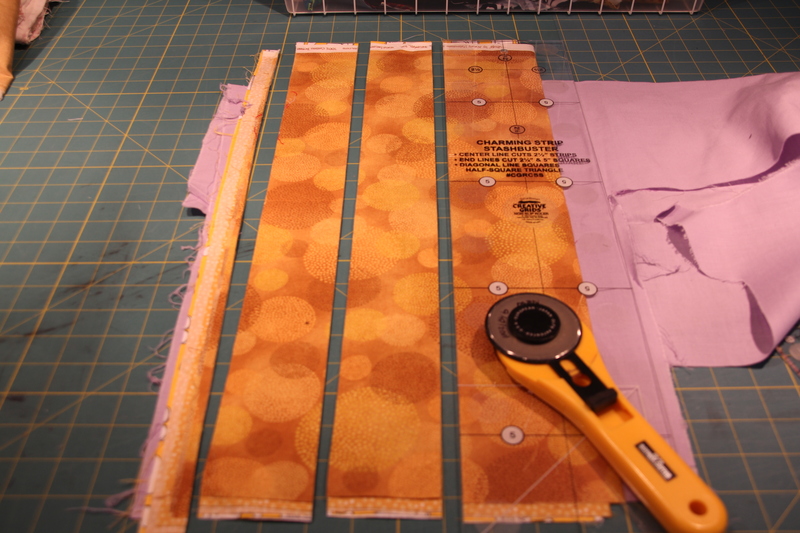 If that is hard for you to do… you would need to put the strips in a brown bag, and pull them out as you sew. The beauty of this block is the random aspect. Sew them together into pairs, and press. Sew two pairs together and press. 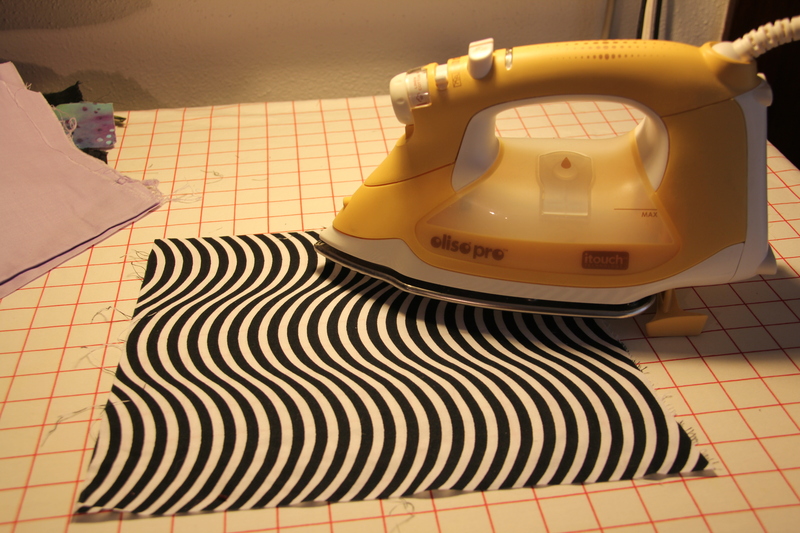 Sew a pair to that set, and you’ll have your six strip units. Remember, they need to measure at least 15 inches! 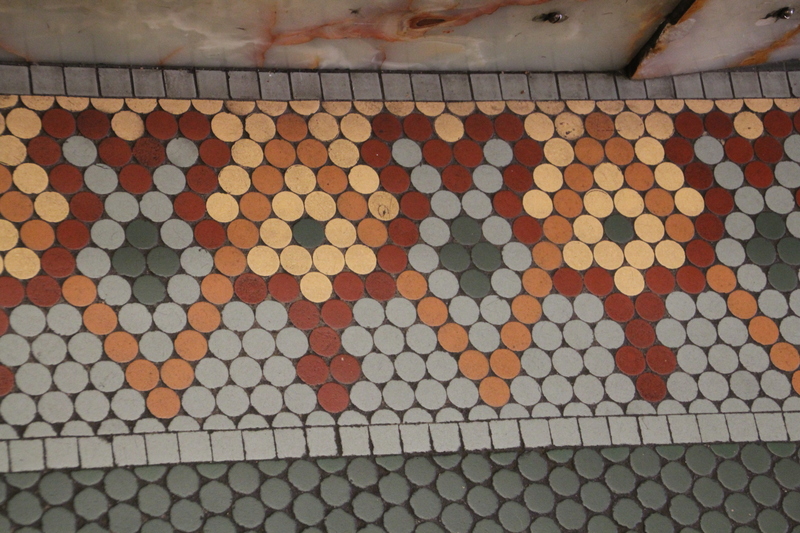 They will look like this… You’ll get one 12″ finished block from each strip set. Make as many as you need. Be careful, this is addictive!